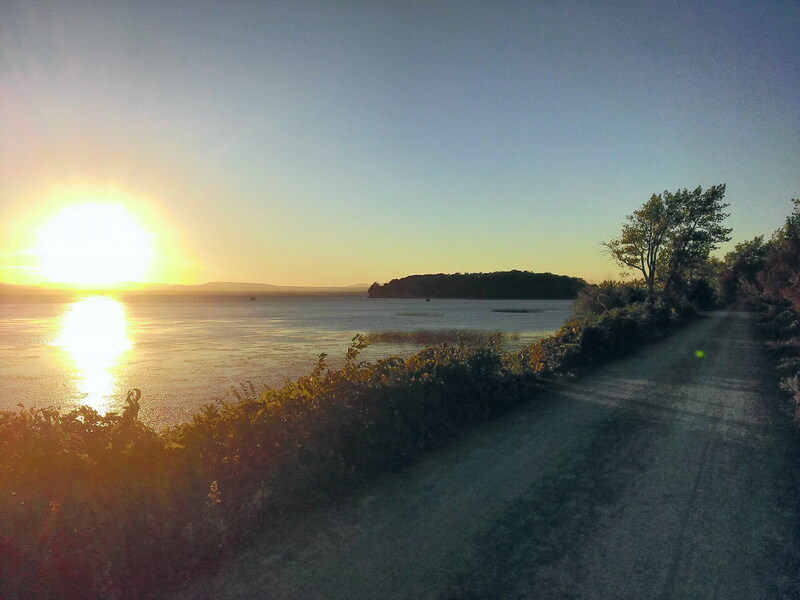 The Island Line Trail is a 14-mile (23 km) rail trail in northwest Vermont. It comprises the Burlington Bike Path (Burlington), Causeway Park (Colchester) and the Allen Point Access Area (South Hero). Location: Railtrail along the east shore of Lake Champlain in western Vermont, connecting the towns of Burlington, Colchester, and South Hero. Many access points in Burlington, Colchester, and South Hero, Vermont. Southern terminus at Oakledge Park off Flynn Ave in Burlington. Northern terminus off Martin Road in South Hero. The Island Line Trail is a 14-mile (23 km) rail trail in northwest Vermont. It comprises the Burlington Bike Path (Burlington), Causeway Park (Colchester) and the Allen Point Access Area (South Hero). The trail follows the route of the Rutland Railroad's Island Line, built in 1901. The northern 3 miles of the trail are located on a causeway that crosses from Colchester to South Hero. A seasonal ferry carries cyclists and pedestrians across the 200-ft gap (boat channel) in the causeway near the trail's northern end. The Island Line Trail at sunset. Photo by SkipperRipper/wiki.